The PS Vita is a great system that not enough people have, and as such I elected to tackle this review because no one else could. The niche nature of the Vita has brought upon an alternating cause and effect ripple that subsequently brought an invasion of anime games. 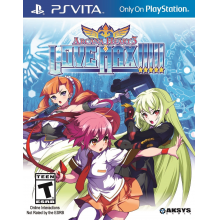 This style of anime games is omnipresent on the Vita, encompassing many genres from RPGs to fighters as we see here with Arcana Heart 3: LOVE MAX!!!!! (that’s 5 exclamation points for those keeping count) which is developed by Examu and was originally released in Japanese arcades in 2009. I had never heard of this series before but the Japanese publisher of this game is what originally caught my attention. Arc System Works is known for creating the excellent Guilty Gear and BlazBlue fighting game franchises. I had enjoyed both of those games on older systems and figured something similar would be a solid experience. Now I have to add a disclaimer that I’m not a fan of anime in general and the anime-style of art is actually a turn off. However, I do enjoy a good fighting game. So even though the “anime girls” art style isn’t for me personally, I’m going to put my biases aside and judge this wholly based on the quality of the game and the features within it. Like I mentioned before, this game targets a certain niche and makes no qualms about doing that as the menu screen has a picture of anime cheerleaders. So that’s the type of game this is, but let’s dive in to the rest of the game. The first thing I noticed is how many options there are; story, after story, versus, survival score attack, trial, time attack, training, PSN, replay theater, gallery, and option. In addition, after story, time attack, and trial are three new modes just for this version, which the arcade version didn’t have. It’s nice to see games loaded with content instead of stuff stripped away to re-sell to you as DLC. Also while this game supports online play, I couldn’t find anyone else playing so I was unable to test that feature. There’s also a bevy of characters to choose from, 23 anime girls in total, plus 23 arcana, which is basically an elemental special power that can add to your character’s defense or offense. The best thing is that the characters aren’t just clones of one other, the play-styles of each vary quite a bit, as some characters may be smaller and more nimble, while others are more heavy hitters. My first time through the story mode, I played as “Fiona Mayfield” which is a maid that has a giant sword. There is a lot of “story” within this game, as there’s tons of dialogue and a lot to follow within this game. Apparently the story follows the evil Drexler Institute and their plot to destroy Japan, which you must stop. I tried to follow the story but lost interest soon after, as it felt like anime; needlessly long with way too much exposition, but if that’s your thing, you’re in for a treat. To me, I had to button mash to skip all the screens so I could get to the part of the game I wanted, the actual fighting. Rest assured if you want the whole anime story experience, the story/dialogue scenes have been remastered for the Vita and it looks objectively fantastic on my Vita’s OLED screen. The story here is a big part of the game, but even if you skip that feature, there’s still quite a bit to appreciate here. When you start the actual game you’ll notice there are borders with your characters and various information in them. The actual gameplay part doesn’t fill the screen and the graphics don’t have the sharpest sprites, as this is a game from 2009, it’s more than passable. The backgrounds look quite good and alternate during battles as well, to keep things from being monotonous. Now, while the sprites aren’t the sharpest, they don’t look bad by any stretch of the imagination, and they do animate very well which is the most important part. Even on the small Vita screen, you can make out subtle animations in the outfits of the characters and expressions on their faces. Each character also has about 10 different color combinations, because variety is the spice of life. As far as the audio is concerned, there’s a nice rock soundtrack somewhat similar to Guilty Gear, albeit less metal. There are also lots of anime voiced sound effects and all the dialogue is in Japanese. Now onto the most important part, especially for me, the gameplay, will it be good enough to compensate for a style I’m not a fan of? That I can say is a resounding yes. Even though I’m not a fan of the anime style, the game does play really well, which is aided by the smooth animation. Moves flow well together and it feels less jerky than many other fighting games I’ve played. There’s a good sense of speed here and plenty of customization from the aforementioned 23 arcana. The controls are also completely customizable as well, which is always a pleasant feature to have. One of my favorite features was the homing feature, which is by default mapped to X, whereas the other three face button shapes are weak, medium, and heavy attacks. The homing feature really changes things up, because whereas most fighting games just allow you to run, this one allows you to fly towards your opponent. Being able to home in on your opponent can give you the chance to fly up at them or dive down or across towards them. It really changes the way I’ve looked at traversal in fighting games, because running or hopping towards your foe is much slower, this gets you in on the action quickly. Even better, flying up really adds another dimension and can give you the upper hand, provided your time is on point. It’s something that really comes into play during the final boss fight, which I don’t want to spoil, but I really enjoyed it as it felt non-traditional when it came to fighting games, as you weren’t just facing an opponent one-on-one. Normally fighting game bosses are exercises in frustration, but this one was a pleasant surprise and while I did have to learn to beat him, it didn’t feel cheap or frustrating. Overall, ignoring the rest of the game that doesn’t appeal to me takes away a significant chunk of the value of the game. It’s a game made for anime fans and with that, it offers a lot more value than it does to me. Is it worth it for someone like me to pick up this game instead of a Street Fighter, Marvel vs. Capcom or even BlazBlue? Well in many ways, yes it does, as this game stands out more as it’s pretty standalone. There have been many versions of these established fighting games, while I like Mortal Kombat, it’s not something new to me. I have to give the game props for standing out in a crowded genre. The most important aspect for fighting fans delivers quite well here. While there is a learning curve, this game offers up unique gameplay and new takes on the genre that help it stand out in a loaded genre. The fact that this PS Vita version is on par with the console version is another big plus. This isn’t a game that’s dumbed down for the Vita; it’s got tons of features and great animations to coincide with its fluid movements. Most importantly, the game just feels good to play, which can be hard to express for a fighting game via text, but there’s a nice flow to it, which becomes second nature after a few matches. With so much content and combinations, there’s a lot of game here, it just helps if the style is for you, but it’s easy to tell that a lot of work went into this enhanced port and full-featured games on the Vita are always welcome. BlazBlue: Chrono Phantasma for PSV Available 6/24! BlazBlue: Chrono Phantasma for PSVita Coming Summer 2014!